Because I have so many posts today, I may skip tomorrow, the first time. This last talk was by Deacon Hunwicke of the Ordinariate, who has a blog here. His talk was about the Anglican Patrimony, which is being brought into the Church by the Ordinariate. His emphasis was on George Bampfield, a great Papist. Deacon Hunwicke will be ordained at the end of this month. Deacon Hunwicke is not only highly intelligent, but very funny. His talk, even after a long day, woke us up. He noted that some Catholics think the Ordinariate is coming to set the Church right. 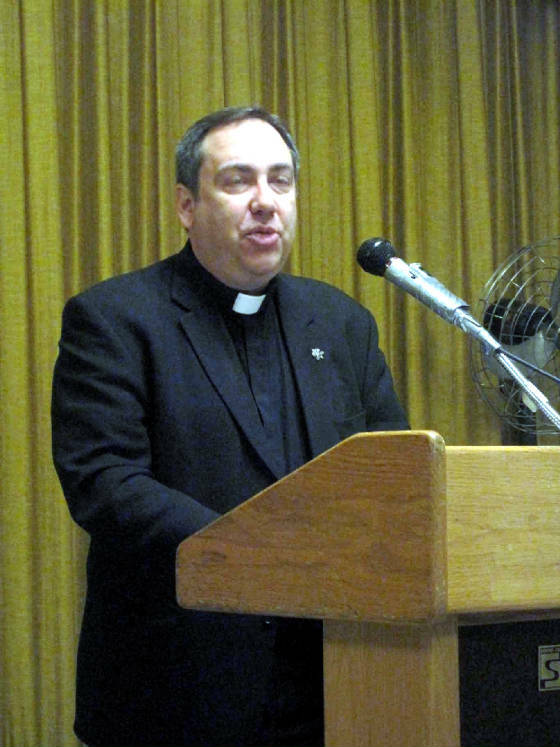 He teaches Latin, Greek and other amazing things and is a TLM priest. He taught at Lancing College. This college had effected other Anglicans and I need to write a separate post on this college. The photo is here. The deacon emphasized the counter-cultural effects of the founders of Lancing College. That the founders were against Victorian religion and the anti-sacramental view of many of the Anglicans is an interesting point, such as their strong view of the sacrament of Confession. Anglo-Catholics. of course, did not have the ability to forgive sins, but the idea of the hierarchy forgiving sins was important for several reasons. One was that it undermined the patriarchal family roles. Also, confession was seen as continental and therefore elitist, and Lancing wanted to make it available to all. I have met other Anglicans from this background, connected to Lancing College, which is interesting that this institution had such a strong influence on Anglicans of a certain sort. I shall write more of Lancing College at another time. The Deacon referred to Manning's association with George Bampfield, whose confessor was Dr. Pusey. And, Bampfield became a Catholic. The Deacon noted that Bampfield appeared at The Oratory in Brompton, Father Faber received him then and there, as this good Deacon noted. He also noted the talk of the town in the 1850s was the reality of the Immaculate Conception. This is all heady Anglicanism, indeed. Bampfield taught Classics at St. Edmund's Ware, and he was at Waltham Cross. Father Bampfield is in Trollope. What fun! Manning was the Archdeacon of Chichester from 1840-1851 and as you know, he converted and eventually became Cardinal Manning. I love all these threads coming together, twisting and turning in history and making the wonderful tapestry which is our Church. I am beginning to understand the beauty of the 19th century heady days of the Oxford Movement's influence on so many people even today. I shall talk with Deacon Hunwicke again after he is ordained Father at the end of this month. 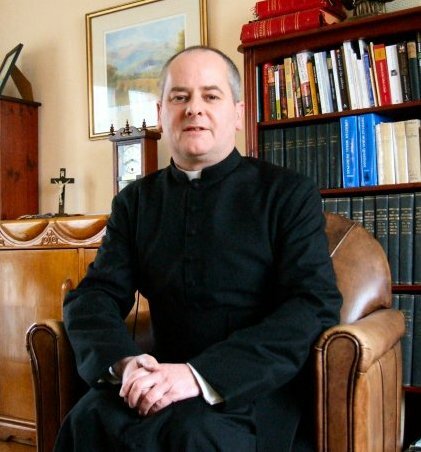 The great blogger, parish priest, dean and other things, Father Tim Finigan gave a talk on the TLM in a NO parish. Father Tim talked about the fact that he is a parish priest of a parish, who said the NO and is now the TLM priest. His life changed at a time when members of the LMS approached him and he was asked to have a Tridentine Mass for a funeral. He said he had two weeks to prepare, although he knew Latin, studying in Rome under Fr. Reginald Foster. And Michael Davies was at the Mass and after that Fr. Tim celebrated the TLM. This rest is history, as one says. He said it was an immediate conversion to the TLM. For many priests, he said, there is such an emphasis on the adoration of God, and the personal sinfulness of the priest, his unworthiness to offer Mass. Father said even the private prayers before Mass express this. January of 2002 was his first TLM. He noted that the NO was then celebrated in a better way. With this change, the emphasis was more on the priesthood of Christ, rather than on the people. This was all before the Summorum Pontificum. By July 2007, the parish was ready for the regular TLM in this parish at Blackfen. Father Tim noted the photos of the Last Supper and the famous paintings that people thought this was a relaxed way, the proper way to have Mass. What people forgot, Father Tim said, was that the Passover Feast was a highly liturgical meal, with many rules and rites. Everything about the Last Supper was clear and formal. Father Tim wrote a long piece on the liturgy, which should be published, by the way, and has not been. "That was not my Mass" was an article in The Tablet, to which Father referred. I remember reading this article and recommend it. Father talked about 321 responses to a survey in his parish, which was approved by his bishop. One of the questions was how the people felt about the TLM in the parish,and many were highly in favor. He said that the age range was interesting. The older the people, the more they were against. While the youngest group were most in favor. This is now commonplace knowledge. Catholics for a Change in Church was the group against the change originally. This is a radical group, like some in the States. Father Tim has a variety of Masses in his parish, including an NO ad orientem. He noted that mutual enrichment has happened in his parish because of the TLM. The idea of singing the liturgy, instead of singing at the liturgy, that is hymns, took shape. He introduced English to Psalm tones with the introit, for example. Father said that the prayers of the priest in the NO changed for him, as it matters what the priest is at the Mass. 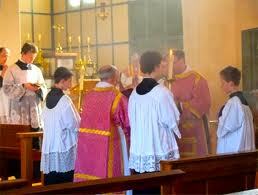 Father reminded us that the Liturgy is not just the Mass and that at his parish he has Vespers in Latin. He also uses the old rite of Baptism and has the TLM for Marriage. This is an important difference which can be discussed in another post. Father went on to discuss the use of sacramentals. Father also mentioned the TLM emphasis on sin and the success of the Counter-Reformation and the teachings connected to the TLM. He mentioned the emphasis on the Four Last Things, which has been lost. His emphasis on the spirituality of the TLM and Trent was great and a much needed conversation. This is a huge subject which I hope he continues on his blog. This good priest and great blogger encouraged the audience and gave many of us hope for the future of the TLM is our regular parishes. So may it happen. The famous blogger Fr. Z., gave the third talk, whose bio can be seen on several websites. The theme of the talk was Save the Liturgy, Save the World. He started his talk with a small talk on the social Internet communication network for Traditional Catholics. The vast majority get their information online!!!!!! What follows is a close paraphrase and some quotations. One of the points which he wanted to emphasize is the borrowed phrase morphed from Heroes. They were saving the cheerleader to save the world. Fr. Z. noted that the enculturalization of the culture is not the point. The Mass is not primarily for enculturalization, or for the improvement of art, architecture, music, etc. In his phrase, Fr. Z. is concentrating on the spiritual, invisible world, which also is a battle ground. The way that we celebrate Holy Mass creates spiritual ripples, he said. 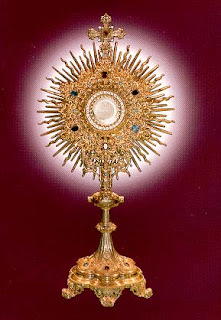 He noted that through the Eucharist the transcendent irrupts into the world. This means that what we do in Church, everything surrounding the Consecration, makes a difference. If a baptized member of the Church does not kneel in Church, this makes a difference. Violations of rubrics effect the entire world. Music, words, gestures in Church effect the whole world. We hurt everyone, he said, if we sin and so, too, there is a personal and corporate connection to the world through our actions in Holy Mass. Worshiping badly effects the whole world. Worshiping well effects the whole world. Fr. Z. spoke of the multiple Masses and the contemplative orders which prayed correctly and reverently in the past. Who can know, he said, how these good orders and the Masses turned back catastrophes in the world? Everything we do surrounding how and what we do in Mass effects the world. Fr. Z said that we are part of a mysterious plan in this. We shall not know our part until the Final Judgement. We can add to worthy worship, not only as an act of love to God, but to our neighbor. We are participants in something mysterious, he stated. He noted that we need to understand what we mean by active participation. What we do is significant and how we pray is significant. He rightly notes that the critics of the TLM continually saying that form is "passive" instead of active. He said that what the Church meant by active participation is not what has been taught. It mean active receptivity. We are to actively receive whatever God wants to give us at Mass, and Mary is our Model. Father noted that Mary was always receiving and pondering in silence what God has given her. He gave the example of the Annunciation. She was silent and then cam the Magnificat. She watched at the Wedding Feast at Cana, pondering and then having outward expression. He was emphasizing that the Mass is not primarily about outward expression, but inward receptivity. Holy Mass is really about what God is doing for us. Fr. Z. emphasized that our receptivity is based on our baptismal graces and state. (Note my posts on baptism below, please). Baptism makes a difference, Fr. Z. noted. The receptivity is active, he said, not passive. We have to engage our will. It is hard to pay attention, he added. It is hard for us to engage our attention for any length of time, he noted. "We can get buried in distractions", he said, and "in our liturgical worship". "I think that with the rise of the new generation of Catholics, unlike the old hippies, who think active participation means carrying things around", is passing, Fr. Z. said. "Here is the point I would like to share with you about active receptivity...here is a little piece of information, useful in this discussion. In 1958, Pius XII promulgated the document On Sacred Music." Fr. noted that paragraph 22 says that proper. most perfect active participation is the receiving of Holy Communion. He noted the pattern of the TLM always in the Mass. It was the same parallel structure in the beginning of Mass and in the offertory. The procession is the parishioners getting up and receiving Holy Communion, a willed interiorly active receptivity, is the outward expression of the interior movement. Fr. Z. went on to talk about the rites helping or hindering the virtue of religion which is the virtue of giving God His due. Worship helps or hinders this virtue of religion. He quotes St. Augustine of Hippo on his theology on the interpretation of Scripture. The saint wrote that the Bible is full of signs, which are all designed by God, the "res", the things, the truths, the meanings. Caritas, the love of God and neighbor are the focal point of all the signs of the Old and New Testament. These "signa", these cultural elements help us to deepen our understanding of the meaning. Fr Z. gave the example of Handel using Scripture to make The Messiah. Father Z referred to St. Augustine of the goodness or badness of a thing or sign. Here is a close paraphrase. Utilitas is St. Augustine's word for determining the good of a thing. If something is useful and leads us to God, these are good. In other words, if something is good, like good music and good art in Mass are good and bad music and bad art are bad for the souls of ourselves and our neighbors. Fr. Z. said that the only reason we go to Mass is that we are all going to die someday and we shall see God face to face. "And, if Mass does not prepare us for death, what is the point", he said. This is a unique position of thinking we should all consider and Fr. said that as a priest he must say this. That he has, as a priest, to talk about death. Fr. Z. noted that St. Augustine calls our awareness of death as our daily winter, the cold reminder of death. Father went on to remind us that many things distract us from death. 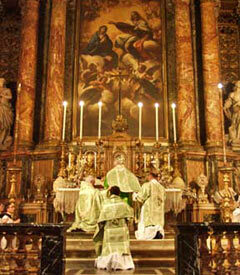 And, the Mass should help us get to heaven and that the Mass should never distract us from that goal of eternal life. We have to die, he reminded us and our liturgical worship should be the means of reminding us of our end and give us the aid to get there. "Our rites have to reflect this, he said. We have to be emphasizing God's Sacrifice which opened up the gates of heaven..this has to be made explicit in the rites all the time." "We have to keep that fact of death before our eyes." he said. The Mass, where the Sacred Mysteries are being celebrated, is where we must meet suffering and death. He noted that the Crucified One is what he wants to see at Mass, not a happy Christ. So, he went on, what are the choices we make in our liturgy which will help us concentrate on that end? We have to encounter the mystery to get us past our fear of death to the magnificent hope and fact of the Resurrection. If we are constantly distracted, he noted, and it is possible to have too much, too many things going on. And a really important point, in the effort of the Church to make everything understandable, happy and chummy, we have, he said, moved away from the challenge of facing death, the mysterious. All this must be met in the Liturgy-the encounter with the mysterious. Fr. Z referred to the cleft in the rock where Moses stood while God passed by, the Back of God. That is the kind of thing we should be focused on in our liturgical resources. Father noted that people who go to the TLM for the first time meet something mysterious and hard to understand and that this is good and real. When we fall into the trap, Fr. Z. said, of trying to understand everything, we create, as Cardinal Ratzinger said, a golden calf, something easy to understand, not something mysterious, like the spiritual God. The point Fr. Z. emphasized was that the people knew the golden calf was not God, but they chose something which was comfortable and that we cannot fall into the same trap of wanting to be comfortable at Mass. Mass should be challenging and even terrifying, he said, in the face of the Mystery of God and our final end. I hope you can follow all the threads here, as this was a packed talk. I am still at the Latin Mass Conference on Oxford Street in London. The second talk was by Stuart McCullough of the Good Counsel Network, which I am part of as a prayer warrior for those girls and women getting abortion. Last month we prayed for a woman who changed her mind after the abortion clinic caught on fire. 70% of the women who are counseled decide not to have abortions according to Mr. McCullough. This group should be supported by those who are in America and in Great Britain. I cannot recommend this group enough. Here is the link to the website. Mr. McCullough said that the Chicago group saved 2,000 babies a year. We can change the world, people. Part of the mission statement of the group appeals to Mary, the Mediatrix of All Grace. I just re-made the entire Consecration to Mary and ended it in Walsingham. That was so cool for me. Mr. McCullough showed us today that abortion is spiritual warfare. 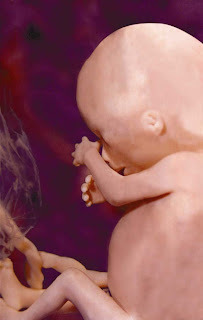 Of course, and there are 600 abortions a day in England, and many, many more in America Stuart said that we need to fast, pray, go to Mass, say rosaries for the women who come to the group. Stuart's message was really Marian. 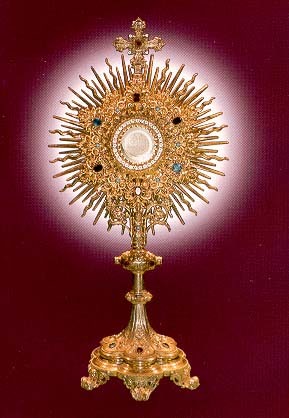 Blessed Mother Teresa of Calcutta said, according to Stuart, that if all Catholics spent one hour a week in Adoration, abortion would end. Why are we not doing this? The Good Counsel Network deserves your support. Stuart noted also that some of the turn-arounds are miraculous. In spiritual warfare, we must do something and the Mass is the most important for traditional Catholics. Stuart pointed out that 95% of the women who come to them want an abortion. He compared the individual woman to a fox caught in a trap which considers gnawing off its leg. Practical problems are easy to solve, but the attitudes of women seeking abortions are the hardest things to change. How sad that the world has created the attitude that motherhood is seen as a horrible experience. Stuart is a sensitive man who understands that the self-identity of women, as he stated, has been changed to the point where they cannot accept motherhood. Adoption apparently scares women, stated Stuart. I found this interesting. In fifteen years, the group has only seen one child given over to adoption. This to me is a new statistic. Another statistic given today is that every week in America, abortions kill thousands of deacons, priests, nuns, sisters, and even bishops. Think about that. This is spiritual warfare. God bless Life. And, remember, as Stuart said this morning, Adoration of the Eucharist is a great weapon against abortion. 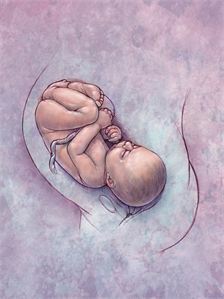 Go, pray, ask for an end to abortion. I am at the Latin Mass Conference in London. I shall report on five talks and may not blog tomorrow because of this great effort. Number five may either be on today or tomorrow, depending on my time. But, the first four are here. Enjoy!!!! The first speaker, Dr. John Rao, the Director of the Roman Forum found here. The forum has been in existence since 1969 as a bastion of Catholic culture and the Latin Mass. The topic that he chose for the conference is from darkness to light. He spoke of the pilgrimage of our lives, how we chose our paths and our life mission, involving the Liturgy of the Catholic Church. He approached the subject in three steps. He noted that the Traditional Liturgy plays a part in the opening or enlightenment. The second section was on the counter-pilgrimage of the new liturgy, The third step he noted was the need to work with ourselves and others on this movement. First, he noted that we need to take seriously the theme of Scripture that the Kingdom of God is at hand at the moment which requires conversion. I have noted this before on this blog, the idea that personal conversion is demanded of all of us by our baptism. The early apologists such as Ireneaus and Justin Martyr pointed out, as Dr. Rao noted, This requires community, in the movement to find Beauty and Goodness are to the individual as well as the community. Dr. Rao used the Allegory of Plato's Cave, the famous treatise, wherein Plato admitted we needed a God to save us. From the Father of Lights, comes the Word of God, the Incarnate One, to take us into the light of grace. We have to abandon ourselves to the light, Who is Light, Who is God. Dr. Rao said that people have to learn how to use nature and all the gifts and tools of God by abandoning ourselves to God. Through Christ we can marshal everything given to us in nature. This is hard work, as many of the saints have noted and as we know from experience. We have to reach out to others, of course. Dr. Rao emphasized the hard work of defeating the downward movement of slumber or darkness. What has this to do with the Latin Mass? Liturgy is an expression of the community, as we know from Greek history. The TLM has been of the primary value of moving people to Christ, and this is a paraphrase of Dr. Rao. He stressed that the pedagogy, the teaching is important, but the Liturgy, the TLM is focused on the Trinity. We are influenced, moved to serve God through our natural gifts through the TLM. Those of us who desire and want to go to the TLM regularly know that this is true, That the Liturgy forms us, gives us a spirituality, forms our community. Step two in his talk, people were revolted by Christianity and were against the popular acceptance of Catholicism. He called them sophists, the historical title for those who want light without Christ. I am glad Dr. Rao referred to the Socratics, as I am of that background of exploring Faith through the Rational. He rightly pointed out that the wordsmiths used words to create negativity towards Christianity, co-opting the Faith. (I call these the Post-post Moderns and the Deconstructionists). These negative philosophers are, as I note here over and over again, really hate the Truth, Who is a Person. Dr. Rao correctly showed the long history of these twists, to the Enlightenment, and to our modern day hodge-podge of modern science and technology, pulling us into fragmentation and darkness. He made the connection to modern liturgy, which was influenced by divisions in the Christian world--in other words Protestantism. He had an interesting note on the Catholics looking for success in bringing in large groups of people in the 1920s and 1930s. Of course, as I thought during his talk, there was a revival of Catholicism in England and France at that time, with people, (and I am adding this here, as he did not refer to these men, Dawson, Belloc, Maritain, Gilson). Dr. Rao claimed that the new liturgy was a result of the loss of vision and furtherance of passions, which we here on this blog can all agree upon. The third step in his talk had to do with engaging seriously in personal transformation of the environment around us. He claimed that we are split in our Catholicism. I am always writing about this on this blog. WE DO NOT THINK LIKE CATHOLICS-- one of my themes on my blog. I shall continue to report on the Latin Mass Conference all day. 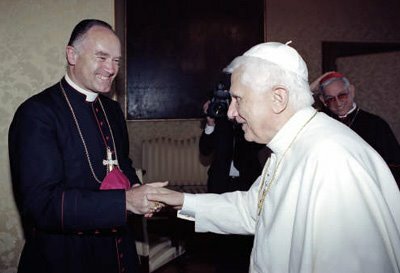 Rorate Caeli has another great interview with Bishop Fellay. Here is the link.